Hi. 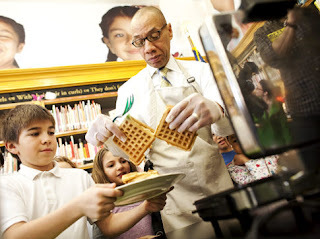 I'm New York City Schools Chancellor Dennis Walcott, and I think it's about time we addressed bullying. Personally I've had it with bullying. That's why I'm making 80 thousand teachers give lessons on it. After all, I've made them come back for full school days on June 24th and 25th, after they've given grades and their students have finished all their tests. What better time to tell 34 kids you oppose bullying than right after you've forced them to come back to a hot classroom for no reason? I'd also like to say a few words about the Democratic mayoral candidates, who have been criticizing the mayor's initiatives, which they have no right to do. It's important we continue closing schools, and those candidates have made unconscionable statements saying we shouldn't do this. That's bullying, and I will not stand for it. Who the hell does John Liu think he is saying we need to involve parents and communities? Does he really think any community would let us come in and close their neighborhood school if we gave them a real say? Of course not. We won't let them bully us like that. We will come in and close their schools whether they like it or not. It's for their own good. We've also had it with those damn UFT teachers. Who the hell do they think they are trying to push an evaluation system on us by negotiating, just because the law says we have to negotiate? We will not be bullied like that. We will accept our own system, with no variation whatsoever, and as soon as they're willing to accept it, we will agree. If not, we'll just let Reformy John King decide, and whose side do you think he's gonna take? Get real, people. Once we get this new evaluation system in place, the mayor can buy himself a suitable candidate, and within two years we can fire every single teacher who isn't part of E4E, so if you want to be working in 2016, you'd better join now. Of course if you don't want to, that's entirely your choice. We aren't bullies and we understand you are free to do as you choose. But we will not be bullied. We will get what we want, when we want, however we want it, and we will settle for nothing less. So I urge teachers to demonstrate to their students that bullying will not be tolerated, and that includes any criticism, however trivial, of our Great Leader Mayor Michael Bloomberg, blessed be his name. Thank you very much, and remember we have cameras everywhere.